Fr Liam O’Callaghan died on 5 April 2014 at the African Missions, Blackrock Road, Cork in his 96th year and the 73rd of his priesthood. He was the oldest member of the Province. His remains rested in Blackrock Road from Saturday afternoon, during which the Evening Prayer for the Dead were celebrated (5.30pm) and the Rosary recited (7pm). 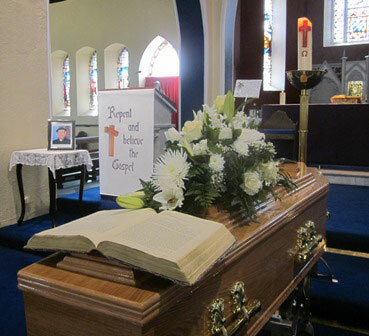 Fr Eddie O’Connor, who worked for many years with Fr Liam in Kaduna Archdiocese, Nigeria, led the Prayers for the Dead at 5pm on Sunday before removal to St Joseph’s SMA Church in Wilton where Fr John O’Keeffe officiated at the Prayers for Fr Liam. We thank God for Fr Liam’s generous offering of himself in the service of the Lord and of others all through his life. We also ask the Lord to console the members of his family and all those who were close to him and will miss him. We welcome here today Fr Liam’s nieces, Gerrie and Mary, his grand nieces, Aislinn and Grace, his great grand nieces, Maeve and Carolynn. We also welcome Donald and David, his many friends, especially those from the parish of Knockaderry, visiting priests, including Fr Gerard Garrett, representing the Bishop of Limerick and Fr Edwin Irvin, PP of Knockaderry, and Sisters, especially the members of the OLA. David, Donald and Aislinn during the Prayers of the Faithful. We remember in this Eucharist the all the deceased members of Fr Liam’s family, his parents William and Catherine, his brothers, Denis and Jim, his sister Breda, and sister-in-law, Patsy. Celebrating with me at the Altar are Archbishop Felix Alaba Job, recently-retired Archbishop of Ibadan, Nigeria, who is visiting his friends in Ireland at this time; Fr Eddie O’Connor SMA (who worked alongside Fr Liam in his latter years in Kaduna Archdiocese), Fr Muiris O’Connor (Limerick Diocese and who spent 8 years on mission in Kaduna with the SMA) and Fr Don Burke (Wilton Community). 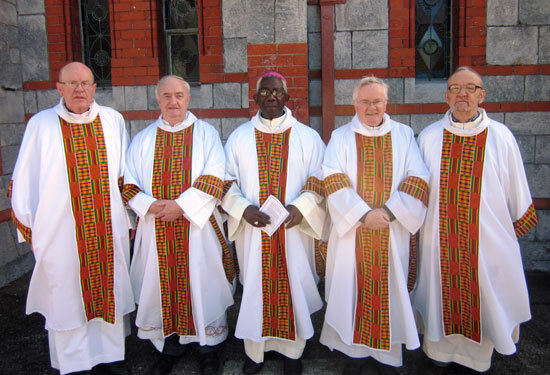 From left: Frs Muiris O’Connor, Eddie O’Connor SMA, Archbishop Job, Frs Michael McCabe SMA and Don Burke SMA. The Readings for the Mass – from the Book of Wisdom, St Paul to the Romans – were read by Fr Liam’s nieces, Mary O’Leary and Ger O’Callaghan. 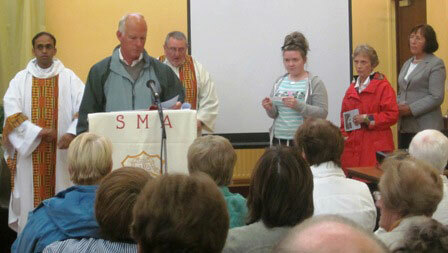 Fr McCabe read from the Gospel of St Matthew. 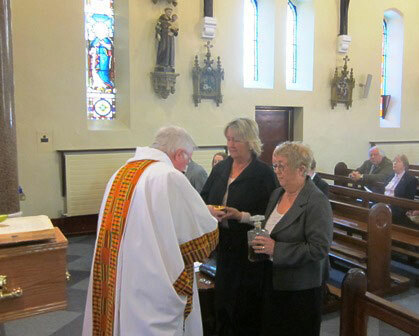 His nieces also brought the bread and wine for the Mass to the Altar at the Offertory time. After his homily the Prayers of the Faithful were read by Fr Liam’s grand-niece, Aislinn, her father Donald O’Leary and her husband David. Fr Liam’s niece, Ger O’Callaghan, paid a moving and heartfelt trbute to her late uncle on behalf of herself, her sister and all the family. She thanked in particular Fathers John O’Keeffe and Colum O’Shea for their care of her uncle during his years in Wilton and, since December 2013, in Blackrock Road. After the Prayers of Commendation the concelebrating priests led the procession to the adjoining SMA community cemetery where Fr Liam was laid to rest. His senior brother is also buried there, having drowned in 1929 while saving a fellow seminarian at a popular swimming place on the Lee Fields, not far from Wilton. Fr Muris O’Connor led the mourners in a decade of the Rosary as the rain began to fall. One could imagine Fr Liam, who had a gentle sense of humor, smiling at everyone gathered round his grave. After the final prayers all were invited back to the community dining room for lunch.